Dell revealed its Windows 8 game plan Wednesday announcing new gear ranging from a Latitude tablet, Ultrabook, and an all-in-one PC. Noticeably absent from the lineup is a tablet and laptop hybrid, something other leading PC makers such as Acer, Asus, and Lenovo have announced. Pricing and ship dates for the new gear will be revealed October 26 with the launch of Windows 8, Dell says. Dell’s most interesting new product is the Latitude 10 tablet. 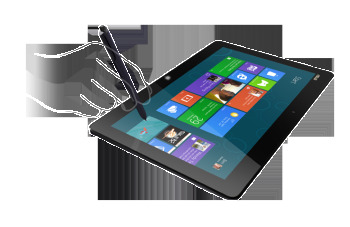 The Latitude 10 is a 10.1-inch Windows 8 tablet with a resolution of 1366 by 768 pixels. It runs on Intel’s Atom system-on-a-chip processor with 2GB of RAM, up to 128GB of flash storage, as well as front and back camera. Dell says it is targeting the tablet at education, healthcare and government markets, and includes a card reader and fingerprint reader. A separate dock will also be available, but it’s not an attachable keyboard dock as seen with other Windows 8 tablet hybrids. Dell’s announced Latitude 6430u “durable” 14-inch Ultrabook is 20mm thin(.9 inches) and weighs just 3.7 pounds. Dell says it is 33 percent slimmer and 16 percent lighter than Dell’s current 14-inch Latitude notebook. It runs on Intel Core i3 to Core 17 processors with up to 8GB or RAM and is designed to meet military testing, which means you can add useful extras such as a spill-resistant keyboard or a free-fall hard disk sensor for preventing data loss. Third in Dell’s Windows 8 business lineup is the OptiPlex 9010 23-inch all-in-one PC using Intel’s third-generation Core processors. The OptiPlex also offers options for touchscreen functionality and fixed or rotating webcams for various business use scenarios. PC manufactures have already previewed some of their Windows 8 devices, including tablets and ultrabooks. Acer, Asus, Lenovo, Fujitsu and Samsung showed several Windows 8 tablets featuring clamshell docks that turn them into full-fledged laptops using the dual touch and traditional interface of Windows 8. Intel will hold an event on September 27 alongside all major PC manufacturers, where it is expected that pricing and availability details will be clearer for the wide range of Windows 8 devices previewed so far.